Found on Etsy: Oblong glass ornaments embellished with Northeastern style Native beadwork. The ornaments have a matte finish at the top, a mirror finish at the bottom, and a center panel of velvet embellished with Mohawk-inspired beadwork. 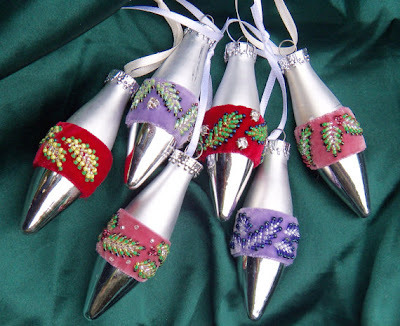 Referencing holly branches or feathers accented with sparkling vintage rhinestones, these ornaments measure 3.5 inches long, not including the ribbon. These treasures are each hand sewn and hand beaded, and will add a beautiful touch to your Christmas tree. From NativeCouture shop on Etsy. $25.